So I have this very old scanner (Epson Perfection 1660 PHOTO), which still works great but for which no drivers are provided for Windows 7. Somehow, a long time ago, on an old PC of mine which I still have, I did manage to install some kind of driver, on Windows 7. I really don’t remember how/where I found it, though (maybe I managed to install a version targeted at another OS – but I tried that again and it didn’t work), and I wasn’t able to find the proper installer. Gladly, there are programs that allow you to extract installed drivers. The one I used is Double Driver. Download links on the official website are broken, so I mirrored the latest version (4.1.0 portable) here. There is also Driver Extractor, but I find it a lot less convenient (I didn’t even manage to find the scanner in their “ordered” list). 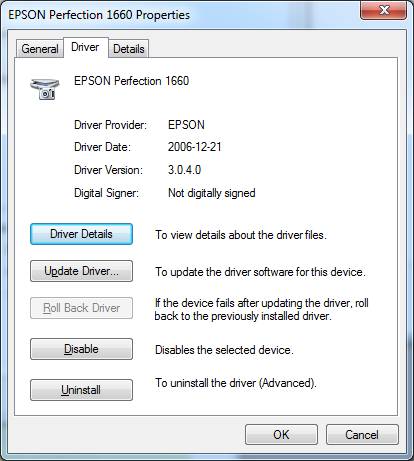 Finally, if you need the Windows 7 x64 drivers for your Epson Perfection 1660, here is the version extracted by Double Driver. I didn’t manage to install it directly. What I did was I plugged the scanner, then I went to “devices and printers”, right-clicked the scanner, then Properties → Hardware tab → Properties button → Driver tab → Update Driver (or just “Update”) button, then chose “browse my computer for driver software” and navigated to where I unpacked my archive with the driver. The wizard should then pick the right file and be able to install the driver. Driver version is 3.0.4.0 and is dated 2006-12-21 as shown in screenshot below. PS: from what I read while looking for a way to obtain the driver (before getting the idea to grab it from the old PC), it seems fairly likely that this driver may also work on Windows 8 or 8.1.